Throughout its history, bachata has been a remarkably adaptable genre. While the fusion of bachata with balada has not been met with widespread acceptance, fusions of bachata with certain other types of music have enjoyed a great deal more success. The generation of Dominicans who grew up during the 1990s listening to bachata is different from the bachateros who went before them. In the Dominican Republic, the new generation of bachateros are much more likely to be from the middle class than earlier musicians were, and many of them have studied music formally. In New York and other U.S. cities, young bachateros have been exposed to international styles which their predecessors had known only from a distance. The diversity of influences present in the work of U.S. based bachateros has provoked an interest in these other styles in the Dominican Republic as well. Although not the best known, guitarist Martires de León has probably been the most influential figure in bachata from 1998 to the present. De León, a prodigiously talented guitarist, has dedicated himself to the study of a wide range of styles on the instrument—among them blues, trio music, and jazz harmony. As an arranger, he has dominated the genre as no one else, with the exception of Edilio Paredes before him; an astonishing number of the most popular acts in bachata use De León to arrange and record their songs, among them Monchy y Alexandra, Alex Bueno, Los Toros Band, Yoskar Sarante and El Gringo de la Bachata. De León and his talented group of musicians have also perfected the formula which Antony Santos and his contemporaries developed of a melodic introduction, verse, and a rhythmic “mambo” section marked by increasingly percussive bass parts and merengue-like patterns on the bongó and güira. One of De León’s most commercially successful strategies has been the practice of recording Colombian vallenatos as bachatas. The first bachatero to successfully employ this practice was Luis Vargas, with “Cenizas frías” in 1994, and even more convincingly with “Volvió el dolor” in 1997, which became one of the most popular bachatas of the decade. After Vargas’ success, an increasing number of bachateros began recording vallenatos. Vallenato and bachata are natural partners in both form and content. 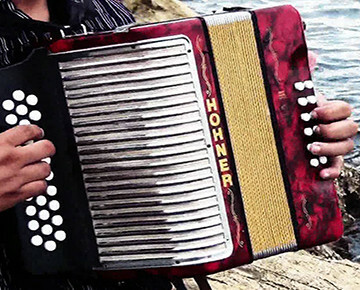 Vallenato, like bachata, has a history as music of bitterness and lost love, and the rhythms underlying the two styles are readily adaptable to one another. The elegant poetry of vallenato lyrics have, in De León’s view, brought bachata to a new level and forced even those bachateros who write their own songs to come up with a more polished product. In the process, bachata has lost some of its significance as an urban folk genre; at the same time it is now able to appeal to a wider and more diverse audience. It must be added that when these songs are arranged by De León or one of his many imitators, they exhibit a whole spectrum of influences besides that of vallenato. Dissonant chords reminiscent of trio music, runs on blues scales, and mambos in the style of Puerto Rican jíbaro music are all hallmarks of Martires’ playing, giving bachata an international sound it has never had before. The refined style has lead to substantial commercial inroads into Mexico and Latin America, with Monchy y Alexandra, Martires’ own group, leading the way. Other bachateros have looked for international appeal. Elvis Martinez, a singer who has used De León for many of his recordings, has given his songs and his image the feel of Spanish rock, along the lines of Maná; David Paredes, Edilio Paredes’ oldest son, had a hit in 2001 with a song called “No Speaki Spanish” whose mambos were straight out of rock and roll (Buddy Holly: “Not Fade Away”); and Zacarias Ferreira had some success with a song called “Amiga veneno” which featured a rock guitar sound, a sound which Ferreira has used extensively on the CD El amor vencerá.